You’ve cleaned up your diet, wielded some portion control, and added Brussels sprouts into your weekly meal planning – but your results are moving at a snail’s pace…when they do move in the right direction. 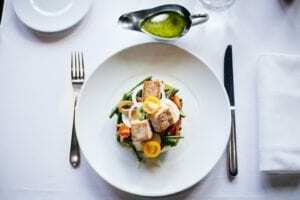 Could the hang-up be in the timing of your meals? Emerging research is confirming some habits that many of our moms and grandmas practiced – smaller meals in the evening and no snacking after dinner. It seems our circadian rhythm (the physical, mental, and behavioral changes that follow a daily cycle – NIH.gov), greatly influences how our bodies handle the nutrition we choose. For example, your glucose tolerance – how well the body handles glucose (sugar) – decreases from morning to evening. This means that your body does a better job of handling blood sugar (derived from food) in the morning compared to the evening. In line with our circadian rhythm (CR), we are active during the day and slow down in the evening and sleep through the night. Or, at least that is what our bodies tend to favor. A recent study by Harvard University found that postprandial glucose was 17% higher in the evening (8:00 pm) compared to the morning (8:00 am). What exactly does this jargon mean? It seems that the body does a better job of utilizing glucose during the day than it does the evening. Perhaps this is why grandma’s kitchen closed after dinner. Late-night snacking is not good for weight management or health. Decreased glucose tolerance in the evening leads to a higher insulin response by the body, which funnels that excess glucose into storage. And not a big linen closet – but fat cells with adjustable storage capability. An occasional late-evening meal or a brief season of a bedtime snacking to sustain breastfeeding is not going to permanently impact you. 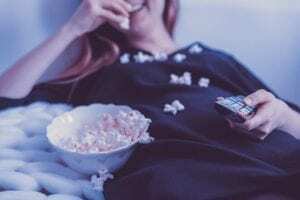 However, months and years of late night snacking will add up to stalled weight loss attempts, impaired glucose tolerance, prediabetes, weight gain, and difficulty sleeping. It seems part of our CR includes fasting – not like the crazy intermittent fasting regimens floating around on the inter-web. It’s more of a sustainable fasting state from after dinner till breakfast. The meal where you BREAK(your)FAST. You don’t have to clock a precise fast for a certain amount of hours – but create a sustainable rhythm of not eating at night. Your body needs a break from digesting in order to focus on other important processes such as recovery and immunity and cell turnover. Don’t you need a break every day from the sweet “pitter patter” of your littles? If you need a precise number to focus on, aim for 12-hours. If the kitchen closes at 7 pm, you break(your)fast at 7 am. upright the reverse pyramid and eat the other way. According to the USDA, US adults eat 34% of calories at dinner, 24% at lunch, and 17% at breakfast. With this approach, it’s difficult to cultivate a hunger for breakfast when your body is full from the evening prior. Where do we go from here? This is an interesting topic with many layers and way too many rabbit holes to discover. In respect of your precious kid-free time and to avoid info overload, let’s focus on some practical applications to help you trend your eating pattern closer to your body’s natural glucose tolerance: meal timing and meal size. The overall goal is to have meals that are evenly spaced out with plenty of time for a fast between dinner and breakfast. You do you. Dinner should not be your biggest meal. You can still enjoy family time around the dinner table with a smaller meal. Shrinking the size of your dinner meal makes sense since you are probably more active throughout the day and not as active after dinner. Now, your kiddos might be more active in the late afternoon/evening with sports practices so they should nourish appropriately. However, if your active time is behind you, then your bigger meals should be behind you as well. A major trigger for more nighttime noshing could be a restriction during the day. Many dieters struggle with the evening meal because they have been restrictive throughout the day and are huuuunnngggrrryyy at night! If this is you, put down the diet book and eat nourishing meals during the day! Nighttime snacking can be a difficult habit to break. Start by focusing on healthy portions for breakfast and lunch and making sure you are hydrated. Gradually, your body will adjust to more food during the day and less in the evening. Cut your nighttime snacks in half for a week and then in half again until you are not having any. Turn off the kitchen light and move to another room to fully signal that the kitchen is closed after dinner. These are not hard and fast rules – more like guidelines. For overall health and weight loss/management, it’s better to nourish your body in a rhythm that trends with your body’s circadian rhythm and best matches your glucose tolerance. If you are pregnant or breastfeeding – your body’s number one job is growing and feeding a healthy baby. A higher-protein snack before bed can help with glucose fluctuations during pregnancy (not to mention a more active night with frequent bathroom trips to empty your squished bladder) and breastfeeding/tending to a newborn. 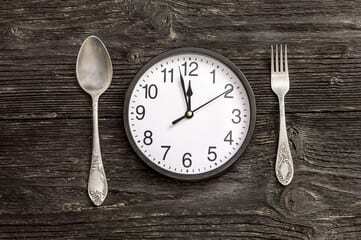 Improving your meal timing may help you meet your goals in health and weight management. It’s not the end-all be-all though. It’s important to continue to focus on healthy and nourishing meals and snacks and to listen to your hunger/fullness cues.